I recently hosted a hearth cooking night at our house, and while I was having too much fun to remember to take pictures during the event, when I repeated some of the experiments on my own later I decided to document it. It’s much easier to cook in a fireplace than you might think! This is the fireplace in my apartment, which is actually rather small. It has a good sized pipkin, a much smaller one, and some chestnuts all in it at once. You could also experiment with roasting (I need a spit!) or grilling, and cast iron will work just fine if you don’t have pottery. Some tips: get the fire going well in advance of when you want to cook. Start with a BIG fire and let it burn down to coals. You’ll actually be cooking over small piles of coals moved off the main blaze. 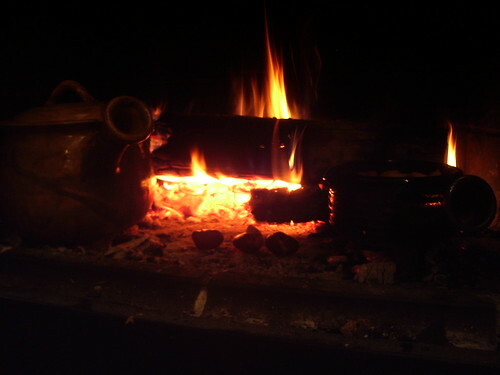 For roasting chestnuts, I heated the base of the hearth with coals, then scraped them back into the fire and put the chestnuts (slashed) on that. This fresh approach on comfort food takes the food readers love to a whole new level. Cooking Light is passionate about making healthy taste great, and for years has been helping readers transform their favorite recipes from their often unhealthy originals into healthier versions that retain all the memorable flavors. Comfort Food is Cooking Light‘s first collection of over 200 classic comfort food recipes that fit into a balanced diet-and no one will know they are light. Readers can choose from fried chicken, mashed potatoes, buttermilk biscuits, brownies and cookies, coconut pie, crab cakes, sweet potato casserole, and more! Along with the recipes, the Cooking Light Test Kitchens staff includes their tips and techniques for lightening a variety of recipe classics-from casseroles and soups to pasta and pancakes, helping readers learn strategies to “lighten up” some of their own favorites. Packed with helpful tips and colorful photos, Cooking Light Comfort Food is loaded with special features: “5 Ways with…” provides readers with five unique recipes for enjoying classics like mashed potatoes, meatloaf, and mac and cheese. “Recipe Makeovers” highlights a reader-submitted recipe and how it is made healthier-while keeping it delicious at the same time. Saving time is always important to busy home cooks, so “30 Minutes or Less” icons showcase super-quick and easy recipes. There is something for everyone in this warm, cozy cookbook that’s chock-full of comforting recipes. 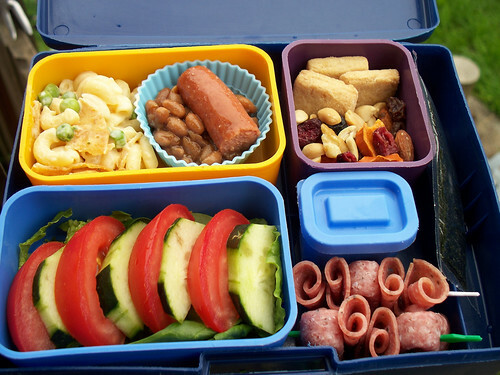 Comfort Foods – Parent’s Beware! Caution: Be careful what you feed your children, you are developing life long habits. All in all my parents did a great job teaching us to eat. Both my sister and I love vegetables, love to cook, are thoughtful eaters and make generally good decisions about what is healthy and what is junk. That being said, we have a deep soft spot for pasta. My sister like spaghetti and red sauce as a hang over breakfast, and when I am feeling sick or low I want macaroni and cheese. 1. Bring a large pot of lightly salted water to a boil. Add the pasta and cook according to the package directions, about 9 minutes; drain. 2. While the pasta is cooking, bring the marinara sauce and crushed red pepper to a simmer in a large nonstick saute pan over medium heat. Cook the sauce, stirring it occasionally with a heat-resistant rubber spatula, until it is slightly thickened, about 5 minutes. Remove the saute pan from the heat. 3. Stir about 1/2 cup of the marinara sauce into the yogurt until smooth (this tempers it and prevents the yogurt from curdling). Then whisk the yogurt mixture back into the marinara sauce. 4. 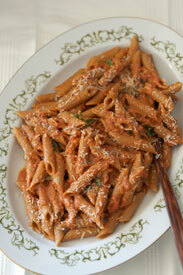 In a large serving bowl, toss the sauce with the drained penne and the basil. Season with salt and pepper to taste. Sprinkle the cheese on top, and serve. Whole-wheat pasta has a dense texture that makes it a little tougher than regular pasta. Some people like that chewiness; some don’t. If you’re in the latter category, overcook it a bit. Toward the end of the cooking time, keep testing it until it’s as tender as you like it. 1. Bring a large pot of salted water to a boil. Preheat a grill or grill pan over high heat. 2. Season the tuna steaks with salt and pepper to taste, and spray them lightly with cooking spray. When the grill is hot, add the tuna and cook for 1 1/2 minutes per side for medium-rare. Transfer the tuna to a platter and allow it to rest, uncovered, for 5 minutes. 3. Meanwhile, cook the haricots verts in the boiling water until they are just tender, about 3 minutes; drain. 4. In a medium bowl, whisk together the lemon juice and zest, garlic, and wasabi paste. Add the haricots verts, scallions, and sesame seeds. Toss to coat, adding salt and pepper to taste. 5. Thinly slice the tuna. Fan each portion onto each of 4 plates. 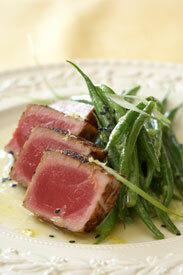 Pile a mound of dressed haricots verts on top of the tuna, and serve.